FEB191056 - What lies beyond our world? Is there a heaven? Is there a hell? When a young man finds himself on the wrong side of life, he encounters Death itself and is set on a quest to seek out his errant demon offspring in an attempt to make his way back to the world of the living! 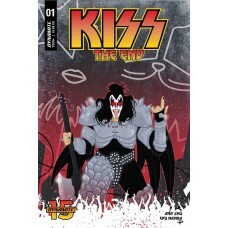 But there is much peril on the way and the only ones who can help him are KISS! From writer Amy Chu (Red Sonja, KISS) and artist Edu Menna (Z Nation, Twilight Zone: Shadow & Substance) comes the next chapter in the KISS saga! Coinciding with KISS' FINAL TOUR, this'll be one for the ages! !